Countless hours wasted in gridlock isn’t the only problem with millions of cars on the road. So too is the way they have of making otherwise beautiful coastal areas look like downtown Beijing. That certainly looks like a self-inflicted wound; something even deserving of ridicule. Nowhere else in the country experiences similar price spikes and shortages. 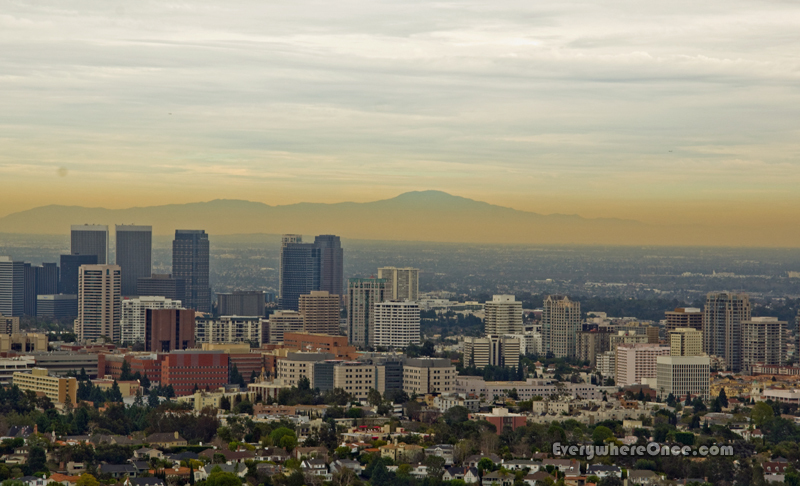 But the view is different from the Getty Museum, or any other vantage point high enough to overlook Los Angeles. From that perspective it doesn’t appear as if environmental rules are too stringent but rather that burning gasoline in California is still too easy and too cheap. That’s certainly not the inviting look I’d think the L.A. Chamber of Commerce would want. Maybe your post will convince them to clean up their act. Doubtful our humble little post will have much of an impact. It’s going to be a tough problem to solve, even if we were trying hard to solve it. Denver too has this brown ring. It can been seen from the south hovering in the distance along the front range. Unfortunately it’s becoming a problem in lots of places. Smog is growing in popularity…more people equals more gas…unless those people start walking, cycling, carpooling, taking the bus, using Zipcar and similar less wasteful methods. It’s up to the people to inspire their government to make change, but if the people want to buy more expensive gas and sit in traffic longer and burn that gas then their government is going to sit just fine with all that extra cash in their pockets. It would help if we created bike friendly roads . . . and also built cities that had a smaller footprint than L.A.’s 500 sq miles. It’s not only the view that’s ruined, but your lungs tend to get clogged, too. Certainly. The health costs of pollution are often (always?) forgotten when people complain about paying more for gasoline because of environmental controls. We’re traveling through Russia and Mongolia this coming summer, and purposely avoiding Beijing…for many of the same reasons that folks try to avoid Los Angeles. I have mixed feelings about that. I wouldn’t skip L.A. It’s a great city despite some annoyances. I haven’t done enough research to know whether I’d want to avoid Bejing, but the thought of missing it makes me sad. Yes, it is sad in that regard…I wouldn’t avoid a visit to L.A. either. We went back and forth about Beijing and decided to fly to Sri Lanka instead. At least that is the plan as it stands today. One of the things I love most about the Asia and Euro countries are that people walk a lot. So much more fun. It just isn’t the same here in most parts of the US – that should change.